With Murli Manohar Joshi and LK Advani sidelined, and BJP leaders Uma Bharti and Vinay Katiyar already out of the electoral picture, careers of the party’s original faces of the Ram Janmabhoomi movement that led to the demolition of Babri Masjid have virtually ended. New Delhi: Days after he was denied a ticket to contest the Lok Sabha election from Gandhinagar seat in Gujarat, BJP patriarch LK Advani finally broke his silence in a blog post on Thursday and wrote the party had never regarded its political opponents as ‘anti-nationals’. The 91-year-old veteran, who was at the forefront of the Ram Janmabhoomi movement that led to the demolition of Babri Masjid, said the saffron party had a history of commitment to freedom of choice of every citizen at ‘personal’ as well as ‘political’ level. “Similarly, in our conception of Indian nationalism, we have never regarded those who disagree with us politically as anti-national,” Advani wrote. Late March, the BJP confirmed that Advani and party stalwart Murli Manohar Joshi would not be contesting the Lok Sabha election, finally shutting the door on its founding fathers. The announcement on Joshi not contesting from his traditional Kanpur seat came days after Advani was denied a ticket from Gandhinagar, with party president Amit Shah taking his place instead. On the day of Advani’s writing, Shah said the party had decided not to give Lok Sabha tickets to those who were over 75 years of age. Hours after Advani posted his blog, Prime Minister Narendra Modi, giving the ‘anti-national’ bit in the post a pass, lauded the BJP veteran. “Advaniji perfectly sums up the true essence of BJP, most notably the guiding Mantra of ‘Nation First, Party Next, Self Last.’ Proud to be a BJP Karyakarta and proud that greats like LK Advani Ji have strengthened it," Modi wrote on Twitter. With Joshi and Advani sidelined, and BJP leaders Uma Bharti and Vinay Katiyar already out of the electoral picture, political careers of the party’s original faces of the Ram Janmabhoomi movement that led to the demolition of Babri Masjid in 1992 have virtually ended. This will be the first time BJP will contest Lok Sabha poll with neither of the four in fray. Joshi was accused of having played a prominent role in the demolition of the Babri Masjid by giving fiery speeches across the country. Advani, in 1990, had embarked on a nationwide ‘rath yatra’ to mobilise Hindu sentiments, rallying ‘kar sevaks’ to converge at Ayodhya. Bharti was a regular face of the Ram Janmabhoomi movement too, and was present at the rally in Ayodhya that culminated in the demolition of the mosque. Katiyar started the Bajrang Dal, the youth wing of the Vishva Hindu Parishad (VHP), to support the Ayodhya movement. 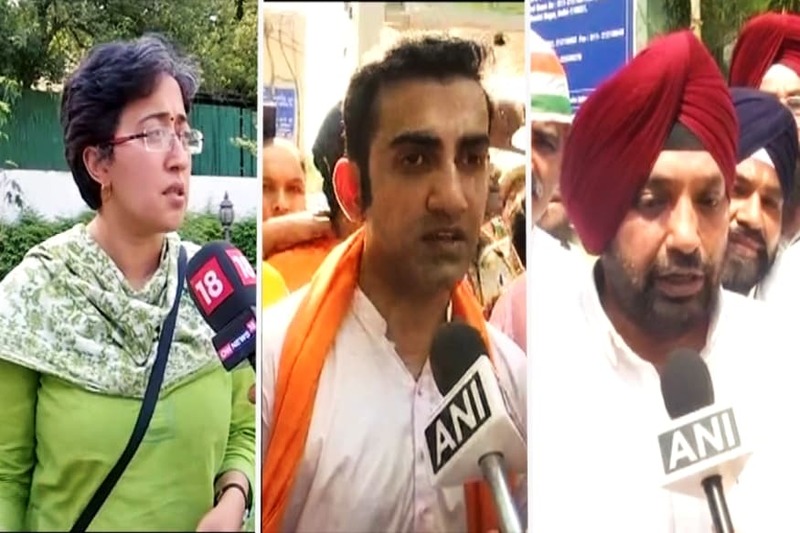 Just as the prominent faces of the movement have been sidelined, the Ram temple issue itself has been put on the shelf, senior journalists and political analysts say. According to senior journalist Sharat Pradhan, the Ayodhya issue has gone down the priority list for Prime Minister Narendra Modi and no longer drew that kind of passion it did at one point. “It wasn’t that big an issue during the Assembly elections last year. It has even lesser importance now,” he said. Author and journalist Ajoy Bose said the BJP had opted to piggyback on the recent military stand-off with Pakistan rather than the Ram temple ahead of Lok Sabha election. “Modi and Amit Shah (BJP president) think that after the Balakot airstrike in response to Pulwama (terror attack), they needn’t use the temple issue that much,” Ghose said. “And, they feel they won’t be harmed by getting rid of Advani, Joshi, Bharti and Katiyar. In any case, they are a fading memory,” he added. In case of Joshi and Advani, Bose said, there was an age factor as well. With Advani being 91 and Joshi 85-year-old, the BJP seems to have decided to leave its history behind. “Advani and Joshi also did not get along too well with the current leadership and were often critical, if not openly then certainly covertly. So it seems the BJP took a call on that front as well,” Ghose said. Early in March, Bharti, 59, who had won the 2014 Lok Sabha election from Jhansi, Uttar Pradesh, and currently serves as the Minister of Drinking Water and Sanitation, conveyed to the party her wish to not contest the upcoming general election. She was promptly appointed BJP national vice-president. According to Ghose, Katiyar, a former Rajya Sabha MP, was ‘quite keen’ to contest the election, but he too did not get along well with the party leadership and nor was he on the same page with Uttar Pradesh Chief Minister Yogi Adityanath. These four leaders, particularly, party veterans Joshi and Advani, who were consigned to the ‘Margdarshak Mandal’, enjoyed a considerable individual support among the masses. Pradhan said their popularity worked against them too. “Modi does not appreciate leaders with their own political standing. He likes the ‘Rajya Sabha types’, who don’t pose any threat to him,” he said. Earlier this month, the Supreme Court ordered mediation in the Ayodhya dispute and set up a three-member mediation panel in the matter. The panel that includes former Supreme Court judge Justice FM Ibrahim Kalifulla, spiritual guru Sri Sri Ravi Shankar and senior advocate Sriram Panchu, has been given a month’s time to submit a report to the court. Whatever the fate of Ram temple may be, the fates of Joshi, Advani, Bhari and Katiyar have been sealed. “There was an old and popular BJP slogan — Bhajpa ke teen dharohar, Atal, Advani, Murli Manohar (BJP’s three stalwarts: Atal [Bihar Vajpayee], [LK] Advani and [Murli] Manohar ). Atalji is no more, Advani’s state is apparent for the country to see and Joshi has now been consigned to the same fate. A metamorphosis has happened between the old BJP and new. This looks like a new party now,” said Sahay.